Sen. Kirsten Gillibrand announced this week that she’ll no longer accept campaign donations from corporate political action committees. The decision aligns Gillibrand with two potential 2020 opponents, Sens. Bernie Sanders and Elizabeth Warren, and with the party’s base, which is firmly opposed to corporate influence in politics. Democratic strategists say the move is smart, and yet another indication of her presidential ambitions. In the latest sign of her 2020 ambitions, New York Sen. Kirsten Gillibrand announced this week that she’ll no longer accept campaign donations from corporate political action committees, aligning herself with the progressive base and moving away from Hillary Clinton’s example. Gillibrand became the fourth sitting Democratic senator to ban corporate PAC cash, putting her in the same camp as Sens. Bernie Sanders and Elizabeth Warren, both of whom Gillibrand may square off against in the 2020 presidential primary. The move indicates the party’s solidifying rejection of corporate influence in politics, the rejection of which may become the next litmus test for Democrats who want to rise in the party. Hours later, New Jersey Sen. Cory Booker, another potential 2020 candidate, announced he’ll also ban corporate PAC donations. Democratic strategists agree the decision is smart, and almost obvious – it will win Gillibrand points with the party’s base, burnish her economic populist credentials, and distance her from Clinton, whose close ties to Wall Street and other corporate interests hurt her during the 2016 Democratic presidential primary. It could also protect her from attacks like the one President Donald Trump launched against her last December, when he called the senator a “lightweight” who “would do anything” for campaign contributions. Jon Reinish, a Democratic strategist and former aide to the senator, said Gillibrand was wise to view Clinton’s “tone-deaf misread of where the base was when it came to money in politics” as a “cautionary tale,” citing the backlash to Clinton’s lucrative speeches for top banks. 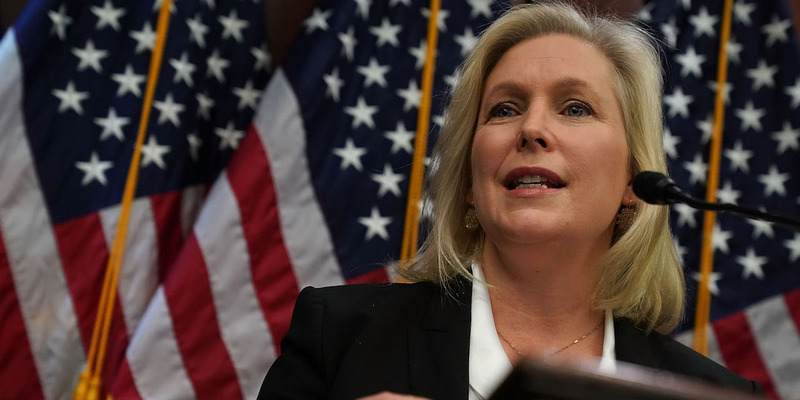 Others agree that Gillibrand has taken a lesson from 2016 – both that money doesn’t necessarily dictate political success and that the Democratic base is firmly opposed to corporate money in politics. And the PAC-money prohibition likely won’t hurt Gillibrand’s bottom line very much. About 15% of the total funds she’s raised throughout her time in the House and Senate have come from PACs, 65% of which came from business PACs, Roll Call reported Tuesday. An aide said the senator will continue to accept money from labour PACs. Bradley Tusk, a venture capitalist and former top adviser to Bloomberg, argued the senator’s decision was also influenced by the declining efficacy of money in politics, which he attributes in part to the increasingly irrelevancy of TV ads. While the senator and her aides won’t confirm or deny plans for a 2020 run, all signs, including her prodigious fundraising from small donors, point to Gillibrand’s higher ambitions. An outspoken voice for the “resistance,” Gillibrand has the most anti-Trump voting record in the Senate, and a recent analysis published in The Washington Post found that she is also voting to the left of her constituents.